Here, we’ve pulled together one of our favorites, Chicken breast stuffed with ham and cheese, our classical favorite, yeah, you can bring new life to chicken! A fast and family-friendly weeknight staple, chicken is a go-to protein choice for busy family members. Everybody loves chicken and healthy chicken recipes. The lean protein is quick cooking, reliable, and affordable. Chicken breasts in particular are a must for you that have limited time to cook. Chicken breasts are versatile, and they’re easy to incorporate into a variety of family favorites, from chinese stir-fries to mexican fajitas. The chicken breast is a food rich in vitamin B3 as 100 g. Of this meat contain 12.05 mg. Of vitamin B3. It has also a high amount of protein, actually 22.20 g per 100 g.
Chicken breast does not contain sugar so that is another benefit. It has the following nutrients: 1.10 mg. Of iron, 14 mg. Of calcium, 0 g. Of fiber, 264 mg. Of potassium, 6.90 mg. Of iodine, 0.80 mg. Of zinc, 0 g. Of carbohydrate, 21 mg. Of magnesium, 66 mg. Of sodium, traces of vitamin A, 0.07 mg. Of vitamin B1, 0.09 mg. Of vitamin B2, 0.84æg. Of vitamin B5, 0.53 mg. Of vitamin B6, 0æg. Of vitamin B7, 9æg. Of vitamin B9, traces of vitamin B12, 4.60 mg. Of vitamin C, traces of vitamin D, 0.25 mg. Of vitamin E, 1æg. Of vitamin K, 212 mg. Of phosphorus, 145 kcal. Of calories, 62 mg. Of cholesterol, 6.20 g. Of fat and 175 mg. Of purines. Given its high protein content, chicken breast is specially recommended for muscle development. It is recommended to eat chicken during childhood, adolescence and pregnancy. The high vitamin B3 content of the chicken breast makes it a beneficial food for the circulatory system. In addition, vitamin B3 or niacin can help lower cholesterol. Due to its high content of vitamin B3, this meat is recommended to combat diseases such as diabetes, arthritis or tinnitus. 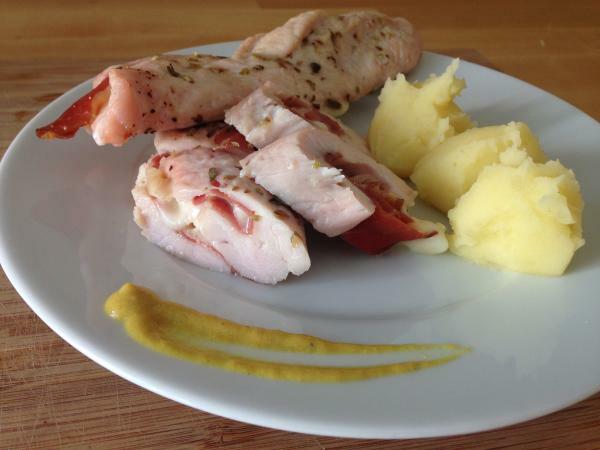 Hope you will enjoy the Chicken breast stuffed with ham and cheese. Add some light onion and mustard sauce, and you have a delicous dinner! Bon appetite!